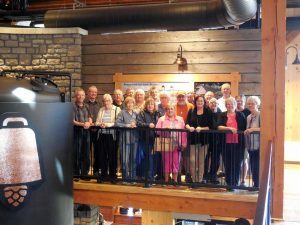 On May 1st, 2018, a party of members and spouses of Local 1863 Retirees Club visited the newly opened craft brewery, Cowbell Brewing Company, in the village of Blyth, ON. Following an extensive tour of the brewery and lunch, the party continued to the workshop of Mr. Everett Hessel, who is an enthusiast and restorer of Model A Ford cars. Attached images of the brewery building’s exterior and interior, together with a group picture. Also an image of some of Mr. Hessel’s restored Model A Ford cars.